Playa del Carmen is a beautiful, vibrant town located on the pristine Caribbean coast of Mexico. It is the perfect base to explore the fascinating sites along the Cancun-Tulum Corridor, now called 'Riviera Maya'. There are miles of unspoiled white sandy beaches and crystal-clear Caribbean waters to explore. Have you ever wondered what the planets, the stars and the universe might sound like? While working individually on very different careers, musician Mickey Hart and Nobelist George Smoot have been wondering about the same question for years. Their mutual curiosity eventually brought them together in exploring this fascinating question at the Cosmology on the Beach conference in Mexico. 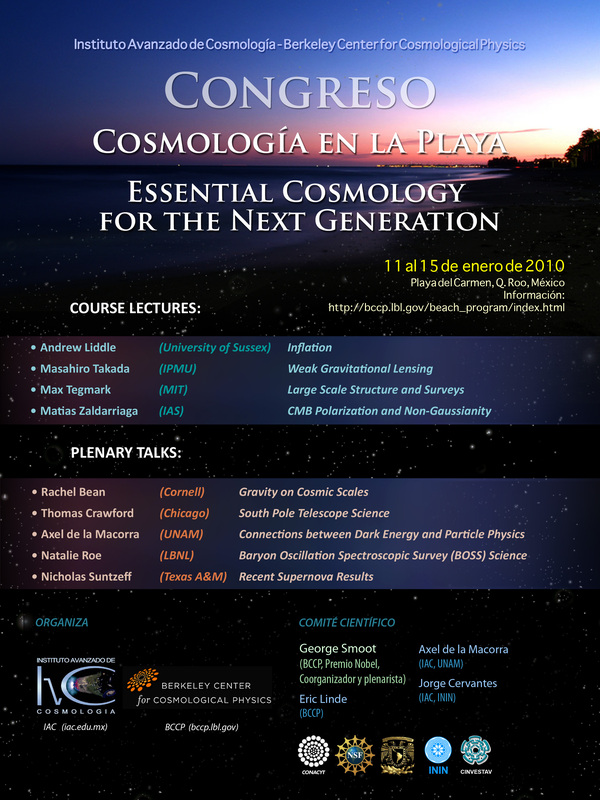 A range of topics in cosmology was covered at the 2010 conference by eminent scholars in the field, with elements of both a winter school and the latest research topics. Students and postdocs presented posters and gave short talks. The beauty of the natural and cultural environment was as a catalyst for young researchers to interact and generate new ideas. We encouraged a diverse group of advanced graduate students and postdocs interested in attending to submit the Participant Application form below. 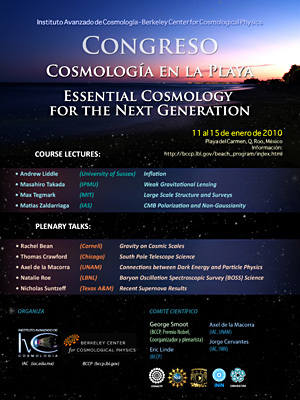 See Cosmology on the Beach 2009 for details of the January 2009 meeting. 2010 have closed. Please visit us again next year.